Cape Town - A secret dossier has revealed how Australia will try and target key South African players in their upcoming Test series. Australia's couriermail.co.au website has revealed the entire Australian game plan for the three-Test series starting in Brisbane on Friday. The report reveals how Australia will look to get into Hashim Amla's head "and play a bit of a psychological war" with the world's best batsman, while also aiming to attack him with a barrage of short-pitched deliveries. They will ramp up the pressure on leg-spinner Imran Tahir in the belief he "can be very impatient with his bowling and it leads to him being expensive." The dossier says there is no way Tahir will be able to dry up an end, like former spinner Paul Harris was able to do. SA skipper, Graeme Smith, will be targeted as an lbw candidate while the Australians believe swing bowler Vernon Philander struggles lasting the distance in innings. In the report they acknowledge Philander is good with the new ball, but feel he is "pretty much untested coming back for third and fourth spells". The home team will also bat aggressively against towering fast bowler Morné Morkel, who they believe can be inconsistent, with the dossier saying: "We want to put him off his game by scoring on both sides of the wicket". Jacques Kallis and JP Duminy are also batsmen who will reportedly be targeted with a barrage of short-pitched deliveries. These revelations are sure to light the fuse for an intriguing and hostile series, with South Africa's No 1 Test ranking on the line. The Proteas, who became the world's top side after an impressive 2-0 series victory in England earlier this year, are looking to repeat their historic series win in Australia four years ago. But the glittering incentive for the home team is that they can usurp South Africa and return to the top of the rankings with victory in the three-Test series, which also includes matches in Adelaide and Perth. Play in the first Test starts at 02:00 (SA time) on Friday. Below is the dossier as published by the News Limited Group on Thursday. STRENGTHS: When Smith plays well, South Africa plays well. He is the key to how South Africa goes. He is a really tough, hard man and knows his game inside out. When in form, he moves beautifully and he can hurt you through the legside. He pulls really well, anything short he tries to pull and he has now got a very-well developed offside game as well. VULNERABILITY: When Smith is not in form, his feet don't move that much and he can be very susceptible to lbw. We should look to develop some doubts in his mind and get him lbw. While he has improved his offside game, he is still less proficient outside offstump. STRENGTHS: He is a very solid player, on both the front and back foot. He has worked really hard and is mentally very strong. He is a good solid opening batter. He just goes about his business and he has a good technique. VULNERABILITY: Is susceptible to the ball coming back in at him. We should look to bowl a few going away from him and then really look to get a good one coming back in at him. That's where we should attack him. STRENGTHS: A quality individual as well as a quality player. 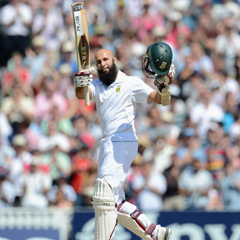 Amla has developed his strengths and through the legside he plays beautifully. He has now developed some good shots through the offside. He scores a lot square of wicket, he hits the ball a lot squarer than most other batsmen because he is very wristy. He has exceptional wrists. He tends to drive square. He has improved out of sight and is a good guy with a great temperament. VULNERABILITY: We should look to get into his head and play a bit of a psychological war. We should also look to attack him with short-pitched bowling, let’s really go after him with some short-pitched stuff. STRENGTHS: A once in a generation player. Never gets the wraps he really deserves but a simply outstanding allrounder, who is great everywhere. With Jacques, you get two great players. VULNERABILITY: We should look to revert to some short-pitched stuff and really test him out with that. Also, he has got such a high backlift he can get caught on his crease. STRENGTHS: An unbelievable player who scores all around wicket - has the potential to be best batsman in the world. He scores off the back and front and he can take us apart in a session. VULNERABILITY: His batting has been deteriorating while he has been keeping wickets. Susceptible to the ball coming back into him, to trap him lbw. If he is scoring well, we should look to bowl wider to him to try to dry him up and he won't like that at all. STRENGTHS: A really good solid player. Left-hander who scores all around the wicket. A very competent batsman. VULNERABILITY: Susceptible early to nicking out, caught behind or in slips. We should look to take the ball across him, slant it, and get him in the corridor nicking. Doesn't like the ball swinging ball back into his pads. STRENGTHS: A player who is all class. He scores well all around the wicket. He just looks so easy at the crease a lot of time, one of those guys that you watch and go 'wow'. He drives beautifully and is a player that fans love to watch batting. VULNERABILITY: He is another batsman we should look to take on with short-pitched bowling. We especially should look to get him pulling. He has an odd-sort of defensive pull, it is neither here nor there and it is an area we can get him. STRENGTHS: He has been outstanding, a late bloomer. He is so accurate he makes you play almost every delivery and is a great weapon, working in conjunction with the other South African quicks. VULNERABILITY: Our batsmen must look to bring him back for a third and fourth spell. We must keep him out there on good batting wickets. He has been great with new ball, but is pretty much untested coming back for third and fourth spells. STRENGTHS: There is not a huge amount that has not already been said. He is all quality and has ability to go up a gear up when he needs to. He has great control, he swings the ball and has got genuine pace. VULNERABILITY: It is almost impossible to pinpoint an area of weakness but he doesn't bowl as well to left-handers. Not sure why. Our left-handers should certainly be looking to score against him. STRENGTHS: A bowler who is very different. That is a good thing from South African point of view, they are all so different. Steyn has skidding pace, while Morne is very tall with the same amount of pace. Morkel bowls really well to left-handers. VULNERABILITY: He can be a bit all over place, we should look to put him off his game by scoring on both sides of the wicket. We should look to test his ability to absorb pressure. He is another bowler we want coming back for his third or fourth spell. STRENGTHS: A very attacking spinner who takes lots of wickets. Has got a good leg-spinner, he has got a really good googly, he has got all the deliveries. Is a genuine wicket-taker. VULNERABILITY: We should really ramp up pressure on him. He has taken a huge amount of wickets but has conceded a lot of runs as well. South Africa used to use Paul Harris to hold the game up for them, but Imran Tahir won't be able to hold up a game. He can concede too many runs. He can be very impatient with his bowling and it leads to him being expensive.